This is the final post in a series related to Solving Department Issues Using the Triad. You can start with the beginning of the series here. This series introduces the concept of the triad, a model used to represent the fundamental objectives of the manufacturing control system. In this post, we'll conclude with the final components: Cost, Quality, and Accuracy. Minimizing costs is the fourth objective. Cost appears primarily as an expense on the Profit and Loss (P&L) statement. Direct costs include material (purchased items and supplies used directly in manufacturing) and labor cost (production employees) while indirect costs include overhead (other expenses and management). Efforts typically focus on reducing both. Generally, the lower the Cost, the better it is for the organization. Most businesses have the goal to minimize Cost because it allows for greater profit margins. Stop rekeying data (into reports, into non-integrated accounting systems). Implementing a purchase cost review system (i.e., annual quoting from multiple sources, purchase price variance and cost set analysis, etc.). Reducing Cost does not mean starving the system from what it needs to run. For example, not having adequate supplies may cause production inefficiencies. There are valid arguments that state that the lowest total cost is achieved when balance is achieved with The Triad. Losing balance increases the Cost of doing business. Quality – Delivering products and services, which meet or exceed requirements agreed to with customers. Most quality systems include continuous improvement. Accuracy – A measure of quality typically found with perpetual inventory systems and order management systems. Accuracy is typically focused on the condition of data (i.e., order accuracy, transaction accuracy, etc.). Bill of Material accuracy and Inventory accuracy are also common areas of focus. 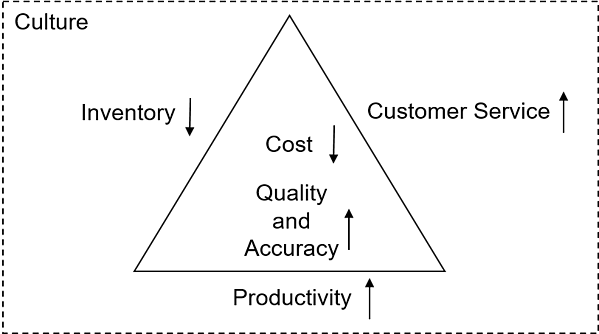 Whether the center of The Triad is Cost, Quality, Accuracy or all three combined really does not change the model or its significance. The model is very flexible in that sense. Components may be rearranged as required providing they are still treated as a whole and not individual entities. The key to success with this model is focusing on the whole. Culture is always in the background of any business system, therefore we can never overlook or underestimate the aspirations of Owners and Managers. Business owners, Executives, and many Operational Managers have the power to decide what their operating units will, and won’t, do. The value and belief system of these key decision makers affect how business is accomplished. They place priorities on different aspects of this model. They are often the source of the conflict between the components, as well as, the answer to those conflicts. Few changeovers and long production runs to maximize Productivity. Inventory increases and Customer Service may decrease. The reason why Customer Service may decrease is because anyone customer may have to wait until an existing order is finished in production before their order is processed. Optimizing the number of pieces cut from a sheet of material without regard for the requirements for each of the pieces. Decreasing service levels and Inventory at the expense of Customer Service. Increasing Customer Service by stocking more and building smaller production runs. Decreasing Cost by stocking more. There are countless variations of how these elements work together. Where they don’t work together we find a condition called sub-optimization. Sub-optimization means that less is obtained from the overall system due to over-focus on one component. In the field, we see many good intentions of improving local productivity at the cost of sub-optimizing the system. The areas discussed constitute what we refer to as “The Triad.” Those areas include Customer Service, Productivity, Inventory, and Cost. Quality and Accuracy are often shown in place of the Cost objective. Unlike cost, however, Quality and Accuracy follow a maximization rule. The higher the measure the better. These areas are natural points of conflict within a business organization. Effective management teams learn to respect and manage these as a group, rather than as individual goals or objectives. The key to the narrative of The Triad is achieving balance among all the components. You should not sell out one area for another. When local efforts attempt to maximize one over the other, conflict occurs, the system is sub-optimized and the overall output falls. Notice the word “narrative” is used here. Gaining a consistent narrative among your leaders is critically important. All the models presented in Exact Software courses follow that goal (i.e., achieve a consistent narrative among the leaders of your organization, department or ERP project team). It makes sense to finish this discussion with a more detailed conversation on where we started. The MAX ERP system is built on the MCS Model, thus understanding the objectives of the MCS is critical. The Triad provides a great tool for reconciling natural differences found in your business.